How to conduct an effective online co... How to conduct an effective online course? 2.1.1.1. This helps prevent student discouragement as students see meaningful assignments as part of their learning and movement toward a goal. 2.1.2.1. This helps student see a positive outcome and can promote satisfaction with the course. 2.1.3.1. Social Presence has been linked with greater success and course satisfaction. 2.1.4.1. Mastering content helps students be successful in the course and their degree program; it also fulfills one of their main goals for entry in to the course. 2.2.1.1. Students often resent these assignments and become discouraged. They also decrease student satisfaction with courses. 2.2.2.1. Same as above, but these are also useless and wastes of time. 2.2.3.1. Can be harmful; be aware of how social media and communication tools can be abused. 2.2.4.1. Cohesion and relevancy are important to students. 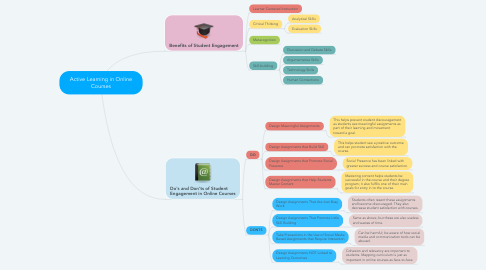 Mapping curriculum is just as important in online courses as face-to-face.